The Trib publishes its second poll of the Texas gubernatorial race. After what are shaping up to be easy primary wins in March for the leading gubernatorial candidates, Republican Greg Abbott starts the general election race for governor with an 11-point lead over Democrat Wendy Davis, according to the latest University of Texas/Texas Tribune Poll. Meanwhile, several statewide races on the Republican primary ballot — for lieutenant governor, attorney general and comptroller — appear headed for May runoffs. None of the leaders in those races looks close to the 50 percent support they would need to win next month’s primary outright. 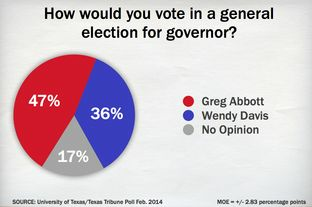 In the governor’s race, Abbott would beat Davis 47 percent to 36 percent in a general election held today, with 17 percent of registered voters saying they have not made up their minds about which candidate to support, according to the poll. In the October survey, Davis’ announcement and sudden political celebrity cut the Republican’s lead over her to 6 percentage points. Now, the distance between the two has widened a bit. Actually, Davis gained a point from the previous poll, but don’t let that get in the way of a good narrative. One could also note that this is a better result for Davis than the PPP poll that came out a few days after that first UT/TT poll and which showed her down 15. One other difference between this poll and the first one is that the first one was a three-way race between Abbott, Davis, and Libertarian Kathie Glass, who got 5%. This poll was a straight up two-way race, which is informative but not directly comparable. One presumes Abbott would have scored a bit higher on that first poll if Glass had not been included. Again, though, don’t let an annoying fact slay a good story. Look, the challenge for any pollster this year in Texas is to guess what turnout will be. Democratic turnout has been flat over the past three non-Presidential elections, while Republican turnout has varied greatly. This year, Democrats have an unprecedented organizational effort to register voters and turn them out. Anecdotally, it feels like there’s a much greater awareness of and engagement in the election this year, but it’s not easy for an observer like me to distinguish between the same old reliables being more vocal and the emergence of genuinely new voices. I’m sure the pollsters are going to go by previous patterns, which is what I’d do if I were them, at least at this point in the race. But this is the key question to ask going forward and as more polls inevitably come out. What assumptions are being made about turnout, on both sides? It’s certainly possible that all of Battleground Texas’ efforts will crash and shatter into nothingness, but by their words and actions the Republicans aren’t betting on that. We just don’t know yet what the effect might be, and polling will reflect that. Before they get to the general election, each faces a primary election. On the Republican side, the poll found Abbott well ahead of his rivals, with 90 percent support among likely Republican voters, followed by Miriam Martinez at 5 percent, Lisa Fritsch at 4 percent and Larry Secede Kilgore at 1 percent. Davis leads Ray Madrigal 87 percent to 13 percent among likely Democratic voters. In the Democratic primary, the candidate who has been on the ballot the most times, Kesha Rogers, leads the best-financed candidate, David Alameel, 35 percent to 27 percent. Maxey Scherr had 15 percent, followed by Harry Kim at 14 percent and Michael Fjetland at 9 percent. Voters are largely unfamiliar with those candidates; 74 percent initially expressed no opinion before being asked how they would vote if they had to decide now. I’d take that Senate result, which by the way has a larger margin of error of 6 points, with a huge grain of salt. Primary polling is a lot trickier than general election polling, and there’s very little recent history to fall back on for guidance. As such, while I don’t have any particular quibble with the gubernatorial primary poll results, I wouldn’t put too much stock in them, either. And on a side note, that previous UT/TT poll had Abbott below fifty percent, with “Don’t Know” being almost as popular a response. You’d think that might have gotten a bigger note in the story. Anyway. The poll summary is here and the methodology is here. One thing I missed originally but was reminded of on Facebook and later by Peggy Fikac is that this poll was conducted between February 7 and 17, which means it all happened before the Nugeaganza and Dan Patrick’s Good Samaritan gone bad saga (the various GOP primaries were also polled). Who knows what effect, however transient, those stories might have had on these results. It also might have been nice for the Trib’s pollsters to at least mention that in passing, given the prevalence and ubiquity of those stories. Be that as it may, I’ll be tracking Texas poll results for 2014 on the sidebar, as I did for the Presidential race in 2012. We’ll see how they stack up when all is said and done. PDiddie has more. I agree that the Democratic primary poll is highly inexact science, but it does lend credence to the theory that Kesha Rogers will do well due to the fact that her name would suggest to uninformed voters that she is black. I’m sorry, but you can’t expect me to take a party seriously that nominates, or comes close to nominating, Kesha Rogers. If she gets in the runoff Texas Democrats should have to take a two year moratorium from calling any Republican crazy. Imgaine if Kesha Rogers wins and Cong. Steve Stockman were to win as well. The general election match-up would be a doozie. Staples has a couple of hot new anti-Patrick web ads up. I hope we get some more polling, with quick turnaround times, soon. On the Dem side, if it’s Rogers and Alameel in the runoff, I’ll pass. Unfortunately, a Green Senatorial candidate with the filed nickname of “Spicybrown” as part of her officially filed listing inspires little enthusiasm in me either.